^ "Final and Complete Election Results: November 3, 1998 General Election". District of Columbia Board of Elections. November 13, 1998. Archived from the original on 2015-11-17. Retrieved February 7, 2016. ^ a b c d "Final and Complete Election Results: September 15, 1998 Primary Election". District of Columbia Board of Elections. Retrieved February 7, 2016. 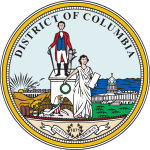 Mayoral elections in Washington, D.C.